Professional tennis players often hit serves at 200 km/hr or even faster. In order to guarantee that a serve will land within the designated service box, players must apply torque on the ball so that the ball will "spin" into the court due to the additional force that the angular velocity creates. This additional force is created because as the ball spins, it disrupts airflow, so that the air on different sides of the ball is moving at different speeds. As a consequence, the pressure on the opposite sides of the ball is also different, by Bernoulli&CloseCurlyQuote;s principle. Because of this pressure difference, a net force acts on the ball, thus causing it to curve downward. 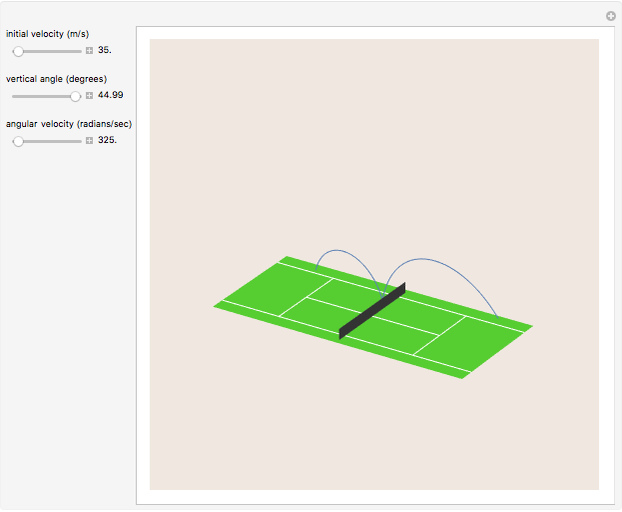 This Demonstration represents a 3D plot of the trajectory of a serve, showing how it is affected by the spin on the ball. The server is standing on the right-hand side of the court. The bounce is rather complicated because it is not a simple elastic reflection in which the ball collides with the ground and rebounds with the same angular and linear velocity. The ball&CloseCurlyQuote;s spin causes a change in both angular velocity and the direction of linear velocity, as is often seen in the famous kick serve. The loss of energy due to the ball bouncing and its collision with the ground is ignored. It is assumed that the ball bounces on a hard court where the coefficient of restitution is 0.8, which means that the ball retains 80% of its kinetic energy. The ranges for the controls are calculated based on the typical ranges for professional tennis players. The coefficient of drag varies depending on only the size of the ball, but the coefficient of lift depends on the spin and the velocity of the ball at any point along its path. where is the radius of the tennis ball, 0.057 kg is its mass, is its speed, is its angular velocity and and are its horizontal and vertical coordinates. The drag coefficient is ; the air density is . Special thanks to the University of Illinois NetMath Program, the Mathematics department at William Fremd High School and the wonderful Mr. Grattoni. R. Cross, "Measurements of the Horizontal Coefficient of Restitution for a Superball and a Tennis Ball," American Journal of Physics, 70(5), 2002 pp. 482–489. doi:10.1119/1.1450571. R. Cross, "Ball Trajectories: Factors Influencing the Flight of the Ball." (Jun 19, 2017) www.physics.usyd.edu.au/~cross/TRAJECTORIES/42.%20Ball%20Trajectories.pdf. Kevin Chen "Trajectory of a Tennis Serve"